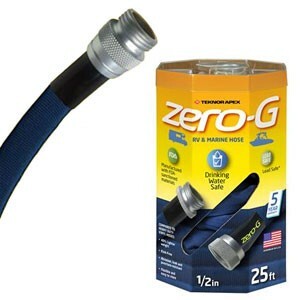 The Zero-G hose for boats and RVs by Teknor Apex is a flexible hose that is made to a much higher standard than other flexible hoses. The hose is basically made with an inner and outer layer. The inner layer is a Tru-Flex layer … what ever that is, but I’ve read on some sites that this is a type of latex?? The outer layer is puncture resistant and glides over outdoor obstacles. This is why they call it a G-Force hose. This design makes it lighter and more compact than other high quality hoses. We love how you can coil the hose up for storage much like a rope or some people roll it up like a ball. Teknor Apex claims that the Zero-G hose will stay flexible all the way down to 35°F. We have not tested this claim. We have always put the hose in a warm locker when temps got below freezing. The connectors on either side of the hose are made with aviation grade aluminum and we have found them to be very well made. They have never leaked and are easy on the hands to tight or loosen. Of course, the most important thing for RVers and boaters is that the Zero-G hose is drinking water safe being manufactured with FDA approved materials and is lead safe. Teknor Apex says the Zero-G hose has a burst rating of 600+ PSI. Wow! I mean that’s amazing if that is true. The hose also has a 5 year warranty. We were very hesitant to purchase this hose since we have had bad luck with flexible hoses in the past. But, this hose had very good reviews on Amazon.com and it was drinking water safe. I bit the bullet and bought two of the 25 foot hoses. One of them has been used on and off for the past year under about 55 PSI with no issues. The other one has been used almost full time 24/7 for the past year also under about 55 PSI. We use this hose as our primary drinking water hose so it is always under pressure. The hoses have performed flawlessly and I don’t make that claim for many products. We especially love how compact these hoses become when packing them for a trip. I mostly coil the hoses the way you would coil a rope. This hose is a must have for RVers and boaters. The hose comes in two colors; black and blue. We purchased one blue hose for drinking water and one black hose for holding tank cleaning. This way you can make sure which hose is for which purpose. You really don’t want to get these two hoses mixed up.